Marvel and Netflix have decided to pull their presentation for The Punisher from New York Comic Con this weekend. The panel was set for Saturday, but in the wake of the recent mass shooting in Las Vegas, which left 58 people dead and nearly 500 more injured, the studios have jointly decided it is best not to have The Punisher, a show which is not going to be shy about gun violence, featured at the convention this weekend. Here's the statement that Marvel and Netflix released regarding the decision. "We are stunned and saddened by this week's senseless act in Las Vegas. After careful consideration, Netflix and Marvel have decided it wouldn't be appropriate for Marvel's The Punisher to participate in New York Comic Con. Our thoughts continue to be with the victims and those affected by this tragedy." Even though nobody, at least not in the general public, has seen any episodes from The Punisher season 1 just yet, what we've seen in the trailers alone is enough to make it easy to see why Marvel and Netflix made this decision. 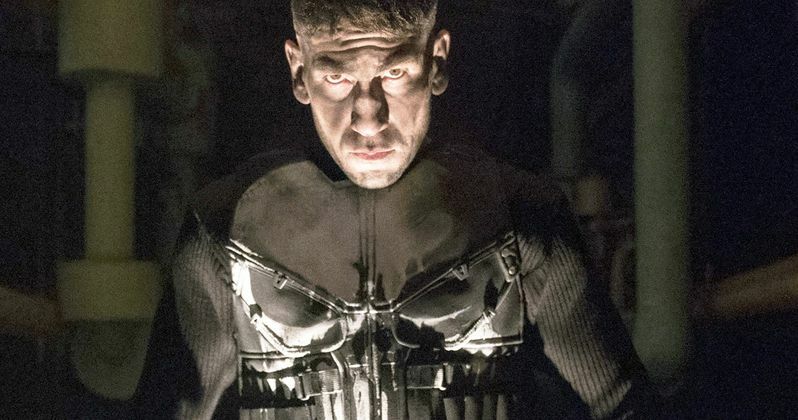 Frank Castle (Jon Bernthal) is an incredibly violent man out for revenge and there is going to be a whole lot of vigilante justice involving guns. Given the public outcry for gun control following the Las Vegas mass shooting, which is said to be the deadliest in modern American history, the timing is far from right to showcase a series like The Punisher. In addition to the cancellation of the New York Comic Con panel, A Punisher preview event that was scheduled to be broadcast from Paris on Saturday, October 7 has also been canceled. This tragedy may do quite a bit to temper the excitement for The Punisher. Fans have been very much looking forward to seeing Jon Bernthal return for his own solo series, following his incredibly well-received debut on Daredevil season 2. New York Comic Con was in full support of Marvel and Netflix's decision to pull The Punisher out of the event. Here's a statement they released on Wednesday, following the news. "New York Comic Con wholeheartedly supports Netflix & Marvel's decision to cancel Saturday's The Punisher panel. NYCC takes great pride in offering fans the best in pop culture programming and we are working tirelessly to fill that time spot at The Theater at Madison Square Garden. We will continue to update fans via our social channels throughout the weekend." At the moment, there's no word on what, if anything, Marvel and Netflix are going to do to replace The Punisher panel at NYCC. They recently wrapped Jessica Jones season 2 and also have Luke Cage season 2 in the works, which they could showcase instead. No official Punisher release date has yet to be announced, but it was expected to drop later this month. There's no telling if these recent, tragic events will delay the release of the series. We'll be sure to keep you up to date as more information is made available from Marvel.